Every generation has its Alamo: its point of remembrance, its rallying cry, its indelible moment of realization which burns itself into one’s consciousness with surprisingly graphic clarity. The mention of this particular event provides instant recall of sights, sounds, and sensations; people can remember exactly where they were, who they were with, how they heard, and how their society was forever changed in that moment. For my grandparents’ generation, it was VE Day — the euphoric celebration of the Second World War’s conclusion in Europe. For my parents’ generation, it was Cold War panic attack following the assassination of President John F. Kennedy. And without a doubt, for my generation it was the terrorist attacks of September 11, 2001. Today in Amsterdam, 6000 kilometers and seven years removed from the events of “September 11th,” I gathered with a crowd of international friends, strangers, and dignitaries to pause for a moment of remembrance. I was asked to serve as something of a correspondent for the memorial service by Expatica.com, so at 10:30 this morning, I participated in an event organized with support from the U.S. Consulate General, as the English Reformed Church of Amsterdam hosted a “September 11th Remembrance Service” in its 400-year-old stone sanctuary. The crowd assembled silently and solemnly, some in crisp charcoal-gray suits, others with T-shirts and sunglasses perched on top of their heads. At least four different news agency delegations were present, their cameras continually clicking and whirring as the organ prelude concluded and the service began. 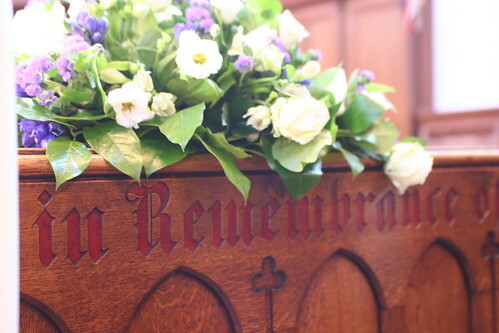 The minister of the English Reformed Church, welcomed the congregation and spoke of a time to remember the “grief and suffering which continues” around the world, as a result of the September 11th terrorist attacks. And for the rest of our 45 minutes together, a succession of representatives from the American Women’s Club of Amsterdam, from the Jewish Community, from the Muslim Community, and from the Diplomatic Community shared brief thoughts and reflections about the events of September 11th, 2001. Almost everyone had some personal reflection about what they were doing that day. One remembered trying to celebrate his son’s 18th birthday as the news poured in from New York. Others spoke of talking with personal acquaintances in New York who were weathering their city’s storm, while still others talked about simply watching the events unfold on television. The newly appointed American ambassador spoke. And, of course, the clergymen prayed. But like the majority of the congregation, I just sat silently throughout the service, filtering through my own thoughts and reflections of that sunny day in September 2001. Following the service, we drank coffee and tea from ceramic cups in the echoing medieval nave, not sure of what to say to each other and absently stirring our drinks with tiny plastic spoons. As I stood there, feeling slightly awkward and unsettled, I started to remember more and more about that day in September, and my own experience of our generation’s Moment. I was in my car, turning onto Conneaut Avenue, close to the Bowling Green City Park. The morning talk show on the radio mentioned how there had apparently been some freak accident with an airplane colliding with one of the towers of the World Trade Center in New York — which was certainly an item of interest and more-than-viable fodder for banter on a morning talk show… But when I stepped out of the car, at the City Park, it didn’t seem like too big a deal. It was a beautiful September morning — sunny and warm, with just the beginnings of autumn’s crispness in the air, and I enjoyed the chance to walk and talk with a good friend. However, when I climbed back into the car and turned the key in the ignition, I was surprised to hear the radio people still talking about the airplane crash in New York City. Their tone had become much more serious, and I was unsettled by the emerging gravity of the situation. It took me about five minutes to drive home. But as soon as I got home, I turned on the television to see what was going on. And the television set didn’t get much rest over the next three or four days. Angry black smoke was pouring out of both towers of the World Trade Center in New York City. And as they replayed (and replayed and replayed) footage of the crashes which started to be referred to as "attacks" instead of "accidents," as I heard more of the news about other plane crashes in Washington D.C. and in rural Pennsylvania, as I watched with millions of my countrymen as the towers crashed to the ground, it felt like life as we knew it had crashed too. The world suddenly became as black and as sinister as the smoke rising up from the New York skyline. Rumors circulated on the newscasts about planes headed for Cleveland, for Chicago — for seemingly every major metropolitan center across the continent. Someone on one of the local stations suggested that the nuclear power plant just east of Toledo could be a target. It was hysteria. Paranoia. Panic. I called my brother Jay, in downtown Chicago — fearful that he could be in a target zone. I called Marci, at work in the clinic in provincial Gibsonburg — which seemed like less of a target zone (although you never could tell, in those panicked hours). And I adhered myself to the television. They just kept recycling the same news over and over, but I couldn’t not watch. It was my lifeline. It’s interesting to remember what it felt like that day. To remember where we were. What we were doing. What we were thinking. Obviously, we’ve all gained much perspective in the days since that fateful day… and we recognize our misunderstandings, our irrationalities, our failings, our fears in the heat of that moment. But it’s interesting to remember… and perhaps instructive. Today, I didn’t really need ministers and rabbis and imams to actually instruct me on the lessons of September 11th. I didn’t really need a church service, with organ music and special numbers about peace and such to comfort my grief-stricken soul. I didn’t need the pomp and ceremonial moments of silence to memorialize September 11th. Still, somehow it felt important to remember. And remember I did. We all did. How could we not?